Netflix is the world’s leading internet network with over millions of members in more than 40 countries. Netflix members can watch their favorite movies, t.v. shows and can stream up to 4 screens at a time. With Netflix you can enjoy your shows anytime, anywhere, on the go or in the comfort of your home, without all the commercial interruptions for one low monthly price. 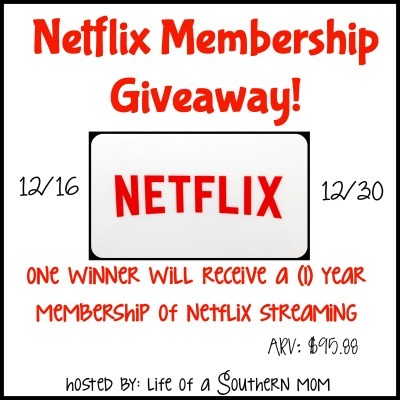 Jennifer at Life of a Southern Mom is giving one lucky reader a chance to win a (1) year membership subscription to Netflix! You can find just about everything you could want on Netflix. They have TV’s and movies that you had long forgotten about from the past. Awesome giveaway here. Previous post: A “Delightful” Way to Start The Day! Next post: Gifts for The Whole Family at Best Buy! I don’t have cable so Netflix would be an amazing treat! Save money. Save time. Flexibility to watch. Selection. Customize show choices. We are a homeschool family and love the magic school bus! Its the best place to watch it. My kids would love this to watch their shows! Because they have an all kids section and I can log my daughter in under the kids section and not have to worry that she might watch something inappropriate. Also they have veggie tales. She loves that. She can watch all her favorite shows and movies in high quality. One reason why I need Netflix- Orange is the New Black. Because Netflix is awesome and we love it! My kids have seen Netflix and really enjoyed watching their favorite shows on it. I am currently unable to renew to get it again right now but I know they loved watching it.